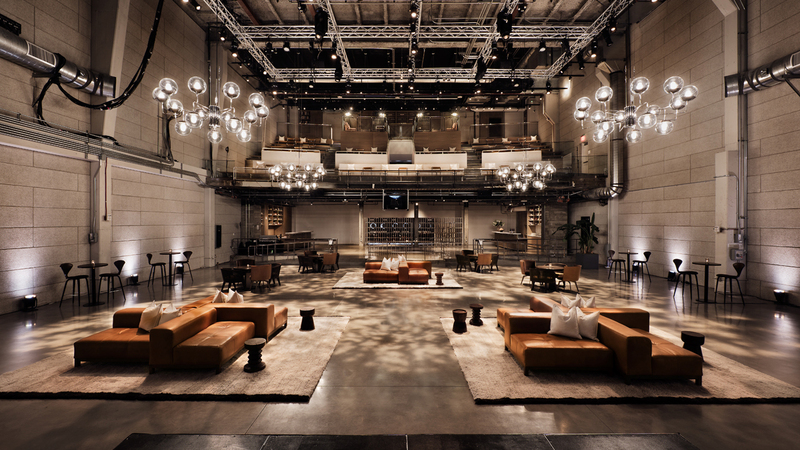 There are plenty of articles about the world's most beautiful coworking spaces, or rehashed posts about the "best" coworking spaces in the world, but this post is going to be different. 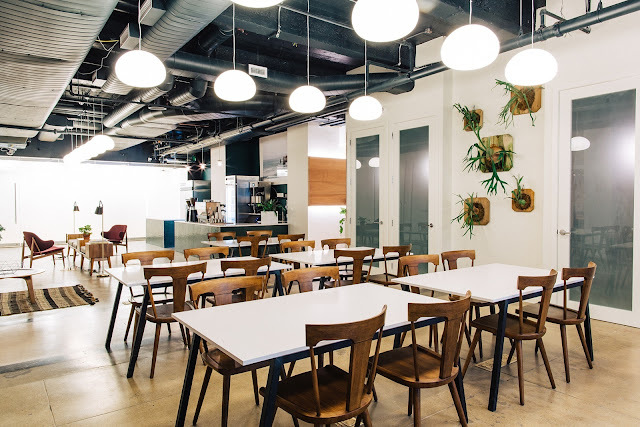 This post is written by someone who has actually worked from dozens of coworking spaces around the world, and have been a paid member of spaces across America, Thailand, Bali and Europe. The goal of this post is to help coworking space owners know what features we actually want and need in a coworking space. And to help you look for the ideal coworking space that will actually help you be productive whether you are working remotely, starting or running your business as an entrepreneur or digital nomad. Most people get tricked into thinking a coworking space is great just because it looks cool in photos, or because it's simply their first time at one. But as someone who's been to over a hundred coworking spaces around the world, I can tell you that most coworking spaces are poorly designed, lack functionality and won't survive in the long run when better spaces open up in their cities. My goal is to help coworking spaces stay open, be profitable, and produce productive members who create cool businesses, make a ton of money, design cool stuff, or maybe even change the world. 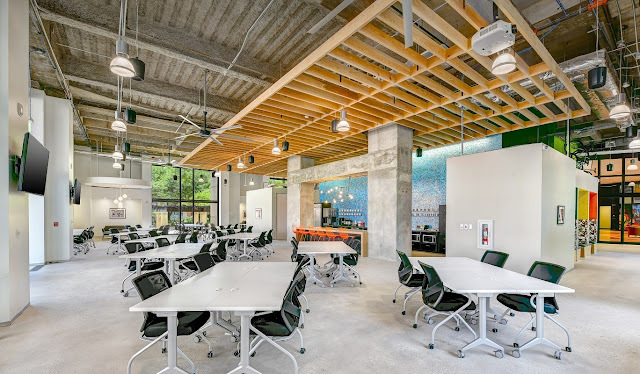 Here is a list of everything an ideal coworking space includes, from types of chairs, features, benefits, and in this post, I'll even include a checklist for you to bring when visiting a new coworking space to see if it's a right fit, or better yet, a checklist for owners of new spaces to use when deciding how to design yours to be the best. Puzl Coworking in Sofia, Bulgaria. Not only have I been a paid member of coworking spaces since 2013, I've now referred literally thousands of people to coworking spaces through my Travel Like a Boss Podcast, the Nomad Summit conference and this blog. More than that, I'm the ultimate coworking success story as I credit the productivity, work ethic and friendships I've gained from working from coworking spaces to taking my business from barely getting by working out of coffee shops, to making over $200,000 a year. I genuinely want to help coworking spaces become better as I want better spaces to work from, and I'm happy to pay for it. I also want to promote the culture of remote working, location independence, and give digital nomads cool places to work from wherever they are in the world. 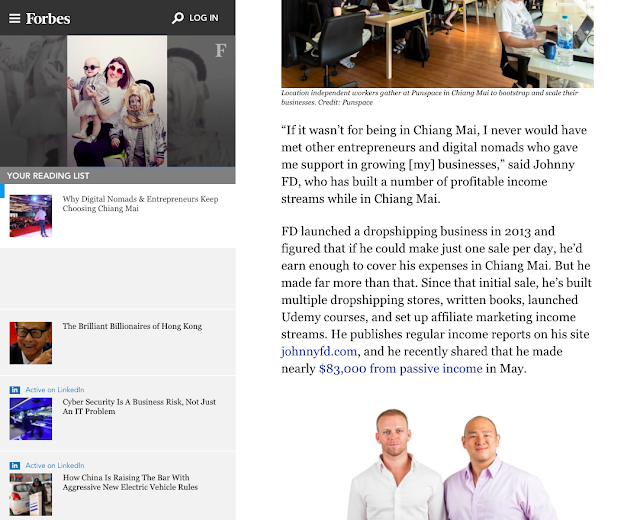 I've mentioned my favorite coworking spaces and have promoted remote working in articles on Forbes, Entrepreneur, Business Insider and BBC. I genuinely believe that coworking is the future and want to help champion the cause as I think everyone should be able to work remotely and I think that coworking spaces allow better productivity than working from home, coffee shops, or even offices. 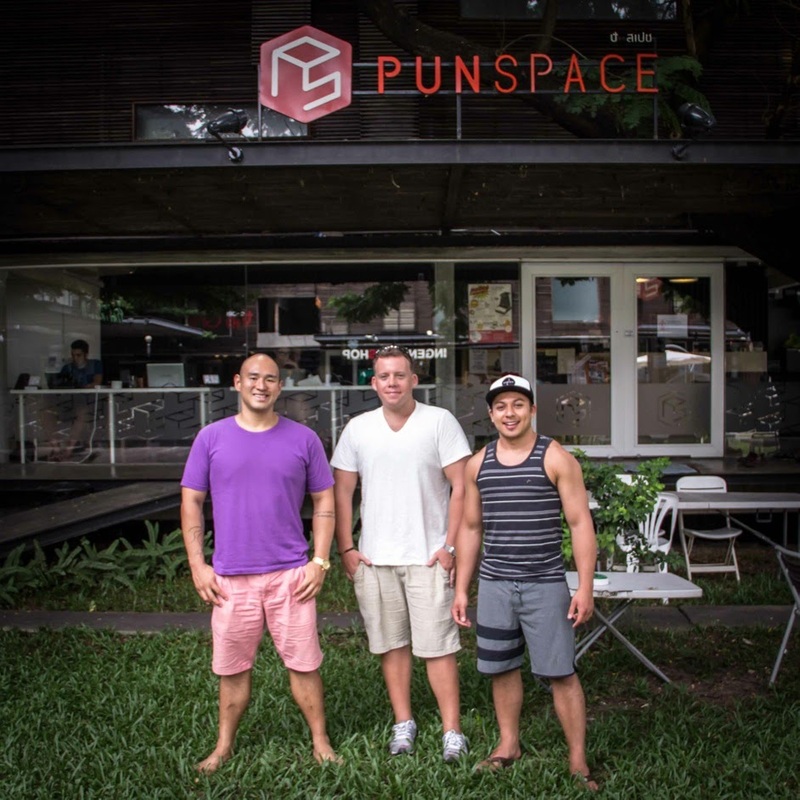 If you asked me what my favorite coworking space in the world is, I'd say PunSpace Nimman in Chiang Mai, Thailand. However, it's far from perfect but is a great example of what makes a good coworking space great. Punspace nimman is a relatively small space that only holds around thirty members at any given time, has terrible instant coffee, doesn't offer free day passes, has a laughable skype room where everyone can hear your conversation, never had a community manager, and had a receptionist that barely spoke English. Yet, it's become the mecca for digital nomads, and has daily visitors from people around the world who often travel 24+ hours just to visit the space. Punspace Nimman is highly profitable, even though it has cheap tables, chairs, low overhead, high turnover, while their second location in the city center is much bigger, has much better features, a built in gourmet coffee shop, proper conference rooms, weekly events, a community manager, is bleeding money. In this post I'm going to dissect what makes PunSpace Nimman the ideal coworking space, what could have made it even better, and what you can take away from the case study. Just like any business, location is key and can make or break a coworking space. Even though most people would tell you that the ideal coworking space would be on or near a beach, in reality, the most successful coworking spaces in the world are nowhere near one. Being near water is a nice-to-have, and I'll list that towards the bottom in this post, but first let's focus on doing the basics right and building a solid foundation. That being said, there is enough room and growth in remote working for there to be a successful space in virtually every city around the world and one of the easiest ways to have success is to find a city that doesn't yet have one and be the first. Simply filling that gap will make you the "best" choice at least until better spaces come along. What people don't realize is that even though I loved PunSpace, I was never loyal to them and would have happily joined a different space and redirected everyone there if one had been built. It's crazy to me that even though a bunch of spaces have opened in the city since then, none of them built a better space. They were all short sighted and built cheaper, smaller or otherwise inferior spaces and tried to compete on price, which as you can imagine has led them to bankruptcy and them to all close within months of opening. Here is a list of must haves in a coworking space. Stable Wifi - It doesn't need to be blazing fast as most people aren't downloading or uploading large files, but it feels to be fast enough to stream or upload an HD video, and video chat without issues. Most importantly you need to be able to have a one hour skype video call without it dropping. The best spaces like PunSpace nimman had more than one connection, so even if the connection from one service was completely down, you could just hop on another, like having both Google Fiber and Verizon. Location - The easy way to find a good location for a coworking space is to find a place that people want to be anyways. Look for hipster coffee shops and cafes, and chances are, that neighborhood is up and coming and perfect for remote workers and digital nomads who love cool places that aren't yet overcrowded, overpriced or too busy. The Nimmanhaemin area of Chiang Mai, Brooklyn verses Manhattan, or Berlin over Munich are great examples of places to look at. Restaurants - It's generally a terrible idea for a coworking space to also open a restaurant inside the space. I've seen this multiple times and they almost always fail as there just isn't enough traffic or customers to make both a restaurant or even a cafe and coworking space work together. Running a restaurant or cafe is a full time business, don't try to often two businesses at once as they'll both suffer. Instead, look for locations with quick, cheap, decently healthy and easy lunch choices within a 5 minute walk away. Coffee - You need coffee, good coffee. Aside from stable wifi and comfortable chairs, free coffee is one of the reasons why people justify paying a monthly membership for a coworking space. However, simply having easy access to great, affordable coffee is actually more important. I never drank the free instant coffee at Punspace, but I didn't mind since I had a place to keep coffee beans, a grinder, and access to make my own gourmet coffee with an aeropress or french press. There was also good cheap coffee within a 1 block walk of the space. Water - Unlimited free filtered drinking water is a must. Get them delivered in 20L bottles, or install a water filter, and encourage your members to refill their water bottles, even to bring home. It's a nice little eco friendly and money saving member benefit that doesn't cost you much money but makes it feel like a huge perk. 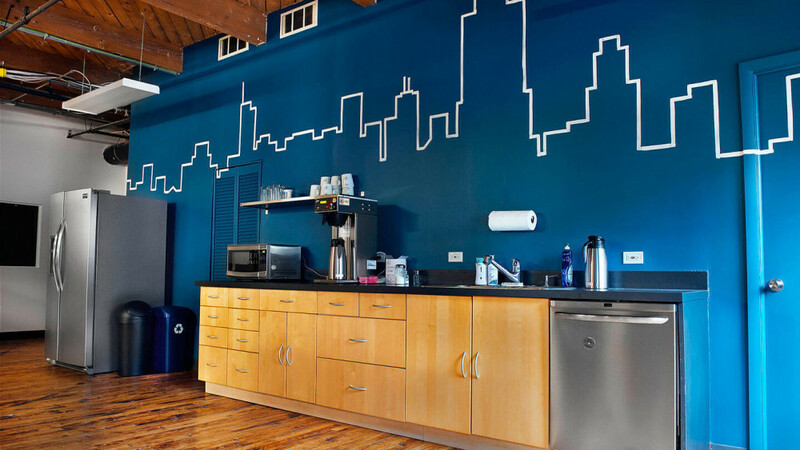 Kitchen - You don't need a full kitchen in a coworking space, and probably shouldn't have one either. All you need is a microwave, sink, forks, spoons, knives, a few plates, and a full sized refridgerator that is kept clean. I recomend having labels and a marker, then moving things to the "free for all" shelf every morning or at least a few times a week, just like hostels do. Cleaner - You absolutely, 100% need a cleaner to come daily, ideally super early in the morning before members start to show up. Encourage members to clean up after themselves and make it easy for them to wash and dry their own cups, but definitely have a cleaner come first thing in the morning and have the place look spotless before 8:45am everyday and not get in people's way during the workday. Also make sure you use fragrance free or eco friendly cleaning solutions as heavy perfumes can cause allergies for a lot of members. Appliances - Even though fancy espresso makers seem to be the norm in coworking spaces now a days, you really don't' need one. They're expensive, loud, break easily, and are difficult to use. Instead you can simply have one or two traditional coffee pots, and or an Aeropress with a metal filter or French Press along with a kettle for hot water. Whatever you do, don't buy a Nespresso machine or anything that uses disposable pods, as it creates a ton of waste. Once you get 40+ members you can then consider buying an easy to use espresso machine that uses whole beans. Stuff - I don't know if other members would do the same, but I've made a habit of buying and leaving blenders (to make bulletproof coffee) and even coffee bean grinders at coworking spaces I've been a member of. I've even left a blue yeti USB mic, and a hoverboard at spaces for members to use. Having things like that for community use really adds to the perk of being at a coworking space, and is something a coworking space can either provide or ask members if they want to all chip in to buy one for community use. Perhaps the most important aspect of a great coworking space is a good community. The funny thing is, the best community in the world never had a community manager until recently and hiring her didn't actually help anything. The reason why PunSpace Nimman had such a great community without any guidance is because it was easy for members to organically meet each other, go to lunch together, and organize events. Simply having a layout where everyone can easily meet each other and is forced to socialize when walking in and out of the space is all that you really need for a successful space. A simple way to get people to meet each other is to have a suggested casual lunch outing or ordering in once or twice a week where all members are invited and reminded to attend. The ideal space is one where it's quiet enough to be productive, yet social enough to give you a reason not to work from home. The best way to achieve that is to have multiple collision points where members are forced to bump into each other and strike up organic conversations. 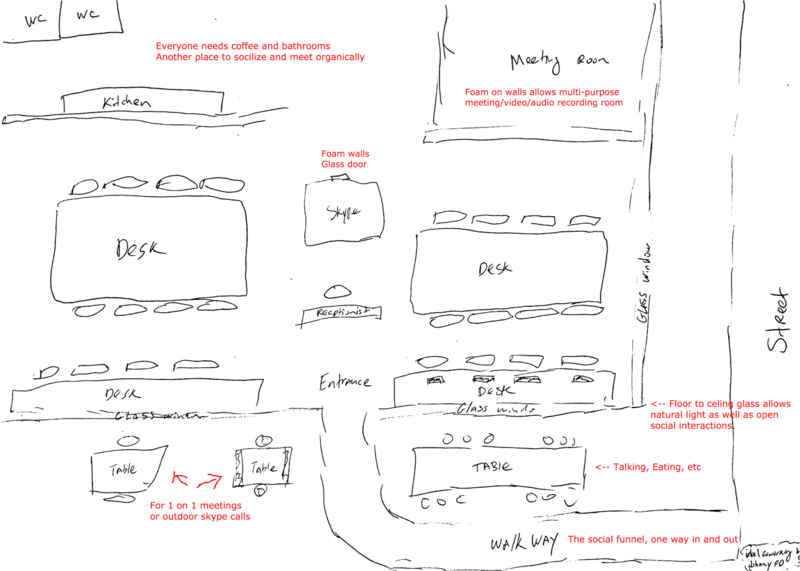 The main social funnel will be the entrance/exit path which forces you to walk past social gathering tables. The second meeting point is the back where you will naturally talk to people making coffee, going to the bathrooms, or going in and out of the meeting or skype rooms. Aside from that, having a facebook group for members, current member wall with photos and titles, as well as a weekly communal lunch is all you need to build a strong community. Ideally if your coworking space was big enough, you'd have a place for members to meet. However, it's not vital and usually it's a waste of space that could have been used for more desks. Weekly meetups and events can happen at local coffee shops, and talks can be held in hotel seminar rooms or other vacant spaces if needed. After visiting hundreds of coworking spaces around the world, I still think PunSpace Nimman is the ideal layout for coworking spaces. The bottom space has floor to ceiling windows which allows tons of natural light, and the funneled entrance allows organic conversations to happen outside. People needing a break or craving interaction can naturally go outside to join in on conversations, and friendships are made whenever making coffee or visiting the restroom. There are private offices upstairs to give teams or those who make a lot of calls a place to work from, but the entire bottom floor is a big open workspace that allows just enough conversation to feel social, while still remaining a productive atmosphere. The above and below drawings are a modified layout of Punspace, while adding in elements of other spaces I've visited that I loved. If you're in a city where the weather doesn't allow an outdoor space, feel free to enclose it with glass, while keeping it feel like an outdoor space with plants and natural lighting. Even though couches look great in photos, they're generally a waste of space so only include them if you have the room. Speaking of which, a coworking space needs to be open and medium to large, while still feeling like conversations from across the room don't affect you. The best example of this is the layout of an irish bar where even though it's wide open and easy to mingle, wherever you sit or stand, it feels like there are distinct areas. Here is a marked up version of the above plan with explanations in red. The thing that drives me crazy most is the fact that coworking spaces often furnish to look good in photos instead of thinking of function first. If you want your members to be able to be productive, and use your space as a real office, build real businesses, or be able to complete an eight hour workday, you need to have comfortable chairs that aren't plastic. If you're a space owner just thinking of short term aesthetics, sure you might get some members to sign up to take a selfie and work from a cool looking office for a while, but you won't be able to keep members long term or foster productivity which in the long run is what is going to make your space profitable and stand the test of time. If remote workers start becoming less productive working from a coworking space than from an office or home, as a business owner, I would cancel their memberships or find a space where my employees can actually focus and produce results. The majority of new coworking spaces seem to have hired interior decorators who order chairs without ever sitting in them first. Chairs made from solely from plastic, metal or wood without any cushion are impossible to sit on comfortably for any extended period of time, especially since most don't have proper backrests, ergonomics or support. A requirement for all coworking spaces should be having someone sit in the chair for an hour or more while doing something productive, it sounds like common sense, but I'm surprised how few coworking space owners have actually done it. The same goes with tables, as a proper working height is essential. The best way to make sure everyone has good ergonomics and is comfortable is to simply have different height desks and different types of chairs. Having different styles actually gives places character, but more than that, it provides options. Having a few spaces for standing desks with mats under their feet for cushion, along with two different height tables and/or adjustable height chairs are ideal. The best thing is, it doesn't need to be expensive. Sure adjustable height sit/stand desks are awesome and so are $1,000+ ergonomic office chairs, but none of them are necessarily. As long as the furniture is of decent quality, people are happy with tables with no drawers, or even special cutouts for outlets. Simple powers strips planed in the middle of the table are more than fine. People just want enough room for their legs, good lighting, a comfortable chair with a locking back and a stable desk at the right height. Here are some basic examples of chairs and tables that work for everyone in every space and every budget. Basic cloth backed chairs like this one. The biggest downside to most cheap chairs is that after a month or two of abuse from members, they will start to bend, tilt, and lose form. 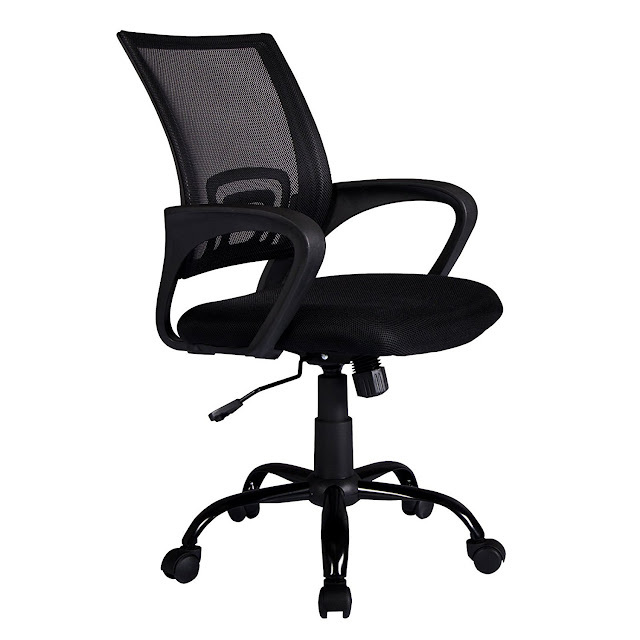 The problem with ordering the cheapest office chairs is the fact that most people incorrectly lean too far back or sit too far forward on the front edge of their chairs which cause damage. 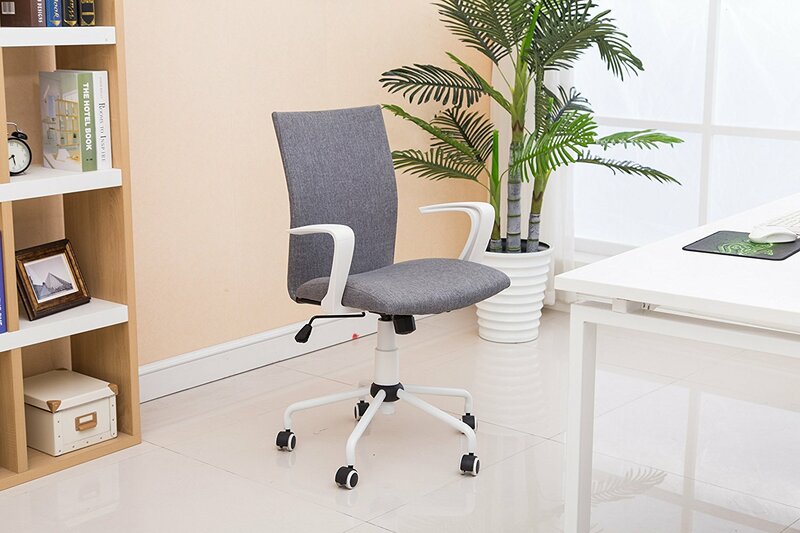 I felt bad for the owner of a brand new coworking space in Kiev, Ukraine as I could feel within days that their designer chairs that looked nice in a catalog was cheaply made and was already starting to bend to one side, which would give workers back pain from the imbalance. But at the end of the day, it was the owner's fault for not actually sitting in the chairs before he ordered them. If anything, coworking space proprietors should simply order one chair and table and use it daily for at least a few days if not a week before ordering the set. It's common sense but most owners don't do it out of laziness or simply not pre planning. If I were to combine two coworking spaces to make the perfect setup, I would take the layout, windows and naturally lighting of PunSpace nimman, combined with the tables and chairs of Soppa De Azul where I'm currently working out of here on the Canary Islands. Having the basics down attracts long term members that choose to stay for months or years, which naturally builds a community, loyal members, and growth. Superficial perks like free beer, swimming pools, or looking cool in photos may attract new members but will result in high turn around as unproductive people can't actually afford to keep paying for memberships long term. A lot of coworking spaces think they need to build a community to attract digital nomads, but in reality, most communities build themselves. Sure, it's nice to make the space available as long as it doesn't involve kicking everyone else out who's trying to get work done, or having weekly communal lunches so people can meet, but aside from that, just having a facebook group or even a whiteboard is enough for people to organize their own meetups and events. What makes Chiang Mai the hub for digital nomads aside from things like low costs of living, ease of finding monthly apartments, and good food, is the fact that there are so many other people there with similar interests. People go places for the community, and digital nomads love meeting other location independent entrepreneurs. The problem with most coworking spaces I've been in America, Ukraine, Berlin, or most of the world is the fact that everyone works for a startup or company and already has their circle of friends. The best coworking spaces are open to meet new people and welcome new thoughts, ideas, and people into their space to learn and grow from. My advice to coworking space owners is to make day passes easy to encourge digital nomads just traveling through to come by, and make monthly memberships affordable enough where people paying out of their own pocket can justify the expense. Feel free to print this out, save it, or just pull it up on your phone number next time you check out a coworking space, or better yet, if you are a coworking space owner, please use this list to create a great one. It's my goal to help coworking spaces be the best they can be as I want to work from them! Location - Are there easy lunch restaurants close by? Coffee - Is there access to cheap good coffee within 1 block or in the kitchen? Water - Is there unlimited free filtered water? Wifi - Is the wifi stable and fast enough to use? Outlets - Are there power outlets at each desk? Natural Light - Are there big windows with natural light? Artificial Light - Is the space brightly and comfortably lit? Temperature - Is there natural airflow or comfortable temperature? Chairs - Are the chairs comfortable enough to sit in for a full working day? Tables - Are the tables the correct height to be comfortable? Personal Space - Do you have room to put your legs under the table, move your elbows? Noise - Is it quiet enough to be productive but social enough to feel a part of community? Nature - Are there enough plants, trees, or green to feel grounded? Calls - Is there a place you can quickly go to either indoor or out to take a call? Meetings - If needed, is there a private place to have a meeting or conference? Recordings - Is there foam on the walls for interviews or recordings? Social - Are the members friendly, is there an easy way to meet others? Hours - Do the open hours fit your needs, are they open on weekends if you need it? Value - Is the coworking space membership a good value or is it overpriced? Aside from the list of must haves above, there are plenty of things that are nice to haves in a coworking space. None of these are make it or break it but are nice touches that add to a space being good or not. As digital nomads more and more often become content creators, these optional touches quickly become reasons to join a space. Podcast Room - Is there a place to record podcasts for yourself or to be interviewed as a founder or success story? A good coworking space would have both creators as well as people worthy of being interviewed. Sound sound denting foam is a must. Having a loaner Blue Yeti is a bonus. Video Room - Is there a place to record videos for content creation or video conferences? If so is there an echo or do they have foam on the walls and decent lighting? Outdoor Area - Even though rooftops are nice to have, few people actually go up there, but outdoor areas near the entrance are ideal for socializing, taking breaks, and getting fresh air. Relax Area - It's nice to be able to take a break from working, which is why couches are a nice to have, but even better would be hammocks where you can read a book, or even take a quick nap. Pull Up Bar - There are a lot of things that look cool in photos like pool tables, swimming pools, foosball tables, and boxing bags that seldom actually get used. But having a simple pull up bar in the corner of your office is great for a quick workout, blood flow, a friendly competition, and for taking breaks. Phone Rooms - Are there extra phone rooms or booths where you don't need to book ahead? These are handy for random calls as well as making sure others don't bother you with their calls. Just make sure they are sound proof, non-echoey, and have air flow piped into them for comfort. At the end of the day, opening or finding the perfect coworking space is complicated. But coworking, remote working, and shared office spaces are without a doubt the future of work. My suggestion is to in person survey potential members before you open your space. Have them sit in chairs, drive to the location, and help you with the design process as at the end of the day, members are the ones who will make or break a space in the long run. Then survey your paid members once a month to see what can be changed or improved. Asking 30 people if the temperature is a bit too warm, too cold, or just right, will allow you to slowly adjust the temperature to be perfect. I've found that the perfect temperature to work in places like Thailand where people show up in shorts and a t-shirt is right around 26C/78F with a lot of airflow with fans, being just a few degrees cooler than it is outside makes it comfortable without being a shock to the system. If your space is in a city where people wear jeans, setting the temperature at 25C/77F may be better. But either way, I've found the most important thing isn't actual temperature but airflow. As long as you have good ventilation or fans, your space won't feel stuffy. The perfect temperature is a personal choice, but in general you want to simply look around and if you see people wearing jackets or putting on sweaters, it's too cold, if you see people sweating, you either don't have enough air blowing or it's too warm. In those cases, turn on a fan first and if you need to change the temperature, don't do it by more than 1 degree or so at a time or you'll risk having wild swings and you'll never find the perfect median. Even though the WeWork's business model may seem ideal, and it's tempting just to copy whatever they do, they've found and carved their niche, and you can do the same with yours. Personally I've worked from multiple WeWork locations and even though they look nice, it's really designed for startups and teams and not for digital nomads or solo entrepreneurs. Opening a coworking space isn't simple, it's an art. I've seen so many spaces make silly mistakes like not having hot desk memberships and only having lobby space or only having fixed desks, buying terrible furniture, or just choosing bad buildings or locations all together. If you're opening a space in my area, or have a space you want me to tear apart for you to make better, let me know in the comments and I'm happy to help. My goal is to have all coworking spaces become better. 2018 Update: I've since been to dozens more coworking spaces and am still surprised how many of them fail to do the basics right and just rely on nice photos or being first. Someone really needs to forward this article to people who are even thinking about starting a coworking space before they start buying furniture or building. Good news however is some people are listening and I've now found two perfect coworking spaces since. The first is the latest Punspace branch in Chaing Mai called Punsapce Wiang Kaew. The location is decently good with a great coffee shop just opposite and a few cheap restaurants within walking distance. They even have a great massage spot next door which is good for afternoon breaks. But the biggest reason this has become my new favorite Punspace and reason enough to make the 10 minute drive in the mornings instead of walking 4 blocks to the one near me is because the nailed everything I mentioned above on the head. The tables, chairs, windows, etc are all fantastic. They've attempted two skype rooms but currently are dark, hot, and without airflow or foam but can be fixed. But they now have a quiet room for working and a separate room for socializing which is great. Currently i'm at Coworking Bansko in Bulgaria and am proud to say that this is the perfect coworking space. The location is great with a bunch of cheap restaurants within a 5 minute walk, they have great free coffee, and a perfect setup for getting things done, perfect chairs, tables, outlets, wifi, skype rooms with foam, conference rooms, a fair price, lots of natural light, an outdoor area, and quiet space, social space, great onboarding and tons of social events. I'll write a full review of Bansko itself soon but as for the layout of the coworking space itself, this is one that every other space in the world should model itself after. Tell me in the comments below, what are your top must haves and nice to haves in a coworking space? I'd love to hear anything I missed! Wow. I just realized that I had been very terrible at picking coworking spaces. I usually look at the location and the pictures, that’s where my observation ends. Thinking about it now, not all of them were comfortable. Your points all make sense, especially the one that emphasized building a community. I believe that has the power to affect me positively and I am looking forward to finding one just like PunSpace. Hey no worries Haxxan, I think most people start with just looking at photos and location. That's why Coworking spaces have spent so much effort on making the photos look good and nothing else. Hopefully with more articles like this, people will start being better consumers, forcing coworking spaces to be better as well. Great article. For me, chairs are the most important thing. Not even #1 on my list but the absolute deal breaker. If the space doesn't have proper ergonomic office chairs, why would I pay to work there? I can just go to a cafe. I'm in KL at the moment and went to one of the coworking spaces here. They had a 100 hours for around $100 package on their web site. I went for the tour and found out that the 100 hours was only to use their cafe and another space with bean bags. The next level up included a proper workspace but cost a lot more. When the guy showed me the map with available seats, about 10% were being used. I did a trial and they did pretty much everything wrong. Seats were under air con units blowing freezing air directly on you, bad lighting, people talking loudly on their phones when there were two empty Skype rooms about 10 steps away! They seemed to be quite desperate to get people to sign up but not willing to make the place more functional. Hey Kathryn, thanks for sharing that! I can't stand spaces that think anyone in their right mind would pay to use bean bags or their public spaces to "work" when we could just do that in any hotel lobby for free. As for capacity any space that isn't 90% occupied by 10:30am every morning is doing something wrong, they either need to make their space better or lower their pricing as something isn't right. Coworking spaces should operate on the gym membership model where they need to sell at least 10% more memberships than seats available as they know not everyone will show up all of the time, that model keeps the prices low for everyone while keeping the space full and profitable. The aircon units that blow cold air directly on people is a huge annoyance and something I've seen all over Asia for whatever reason. They really need to pipe the air flow better so it spreads evening and doesn't just blow on people directly. I agree about the phone conversations being annoying in public, it should never happen at a space and it should be the management's responsibility to ask them to use skype rooms whenever it happens. thanks for this amazingly detailed analysis..makes me wanna open up a space somewhere. ps. what do u think about co-living? is that the next big movement or just a fad for some companies? Hey Steve, glad you liked the post! It was written by me. =) As for co-living, I think it has potential to be amazing. I also think it's going to be a lot more complicated than designing a good co-working space, so we should definitely focus on trying to solve that first! If you enjoyed the article, do me a favor and share it! Hi Johnny, I'm in the middle of opening a new space in Auckland NZ, and would love your feedback if your ever in the neighbourhood. Do you come to New Zealand, and also what do you think is important to include on the website to make sure you attract the right clients, but also tell people enough about the space? 1. Photos of people actually working. If you want to attract a certain crowd, that's mostly done by location, types of photos, pricing structure, etc. Let me know what you mean by the "right" crowd and i'll give you some ideas. Thank you so much! this insight is amazingly helpful :) We're in the process of creating our own co-working space and have most of the things you mentioned (coffee, of course) but there are others that hadnt event crossed my mind. How are you all doing with getting your co-working space started? What area are you in? I am looking to start one in west central florida. I'm super happy to be able to help, feel free to ask any more questions here, my goal is for coworking spaces to actually work as it'll be beneficial for everyone! So glad I found your article. I am in Atlanta but going back to my hometown in Florida to start the first co-working space and I want to gather as much information as possible! What is your recommendation for assessing the interest/potential demand for a co-working space in an area? I'm thinking about starting a Facebook group and then trying to survey people through there. I've also thought about having a "co-working day" event. I would go work out of other coworking spaces for a few weeks or a month in the next city or nearby and see what you personally need/want/like and dislike. Then get to know others and ask them the same. Great article, the best I could find about that topic. I'm a arcitecture student from Germany and your article helped me so much. 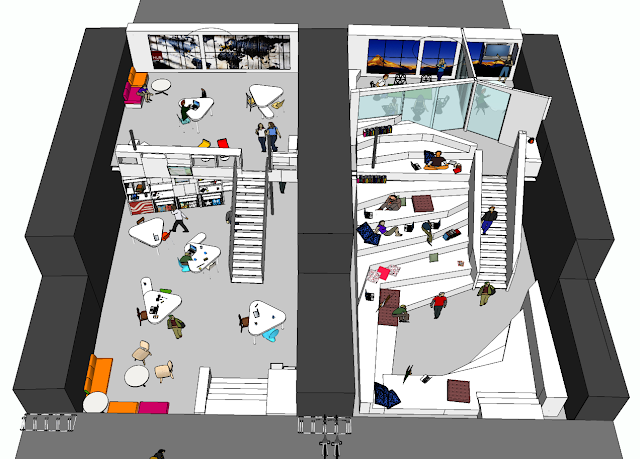 I'm planning an (imaginary) library with a media center and co-working spaces. And you helped me realising that I have to plan more than just office rooms and a kitchen. It was a former living house and I'd say it's a good working area with what I read one your page. 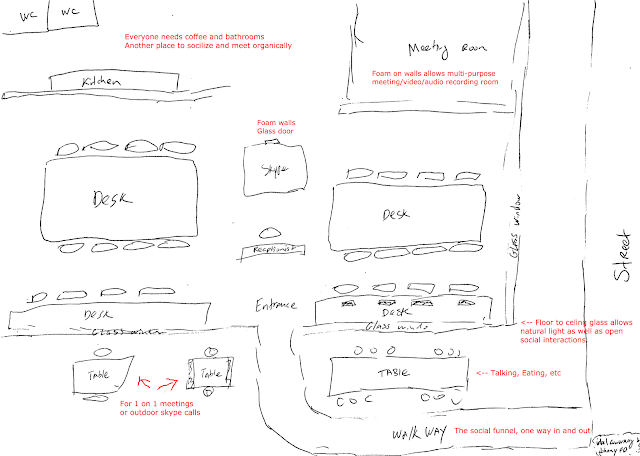 A good location, with coffee/water/fruits, different sized rooms, a lot of naturl light an outside spaces. Hey Kristin, I'm happy you liked the post! Let us know how your architecture project goes!